Sometimes, amid all the hustle and bustle, its nice to just stay at home and relax. Sure, a summer trip to Italy is wonderful, but there is something to be said about enjoying the simplicity of a relaxing afternoon or weekend in the backyard. This Roasted Red Pepper Tartine is for just that: A culinary trip to Italy, that takes just seconds to make at home. The flavors carry me back to Tuscany, and the preparation is so simple that I get to unwind on the back porch a bit and rediscover how relaxing a summer staycation can be. So bring on the heat, we're ready! 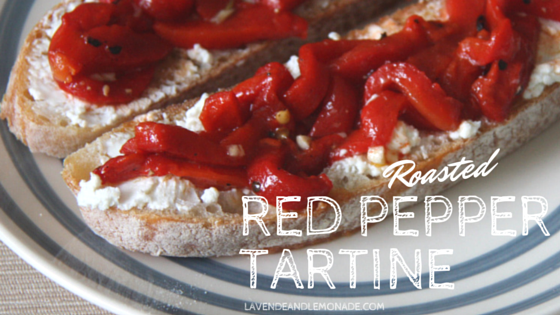 Tartines are classic southern-european snacks and appetizers. Since they're generally served between meals, they're packed with flavor. But that doesn't mean that they're complicated - a few great ingredients and a couple of minutes is all it takes to make an amazing tartine. We discovered this combination on a road trip through Tuscany last summer and have been addicted ever since. Every time I taste it I can almost see the fields of olive trees and chianti grapes. Alas, this summer is going to be much less adventurous on the travel side of things...but there is no reason why we can't bring those flavors right to our back porch! 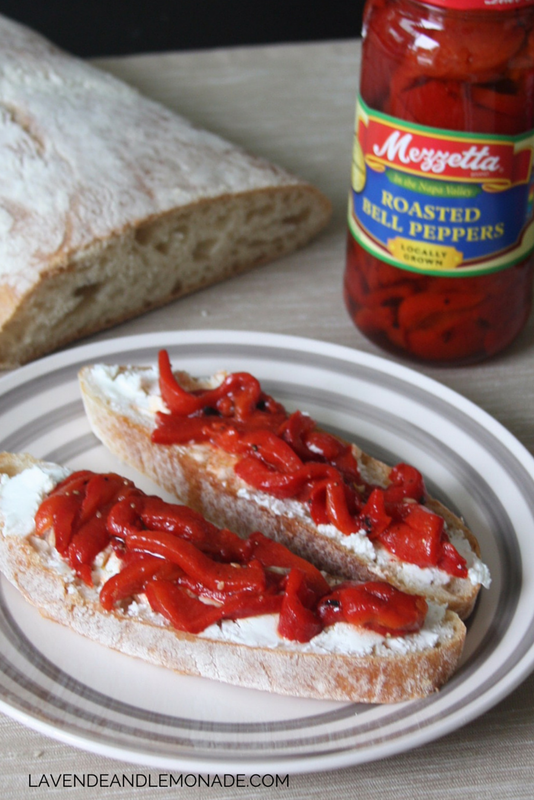 Thank you to Mezzetta for sponsoring today's article! Mezzetta, famous for their traditional glass-packed peppers and specialty foods, is a big fan of staycations as well - and are giving away a Summer Survival Kit to make vacationing at home even more enjoyable. Enter here, once a day! They'll be doing a series of giveaways all summer long, so be sure to check back each month to see what is new! 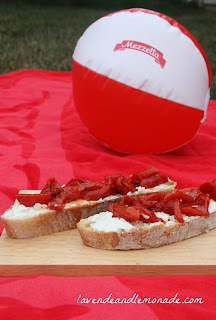 While you're there, check out the coupon to save $5.00 on Mezzetta Peppers, Olives and...sunscreen! 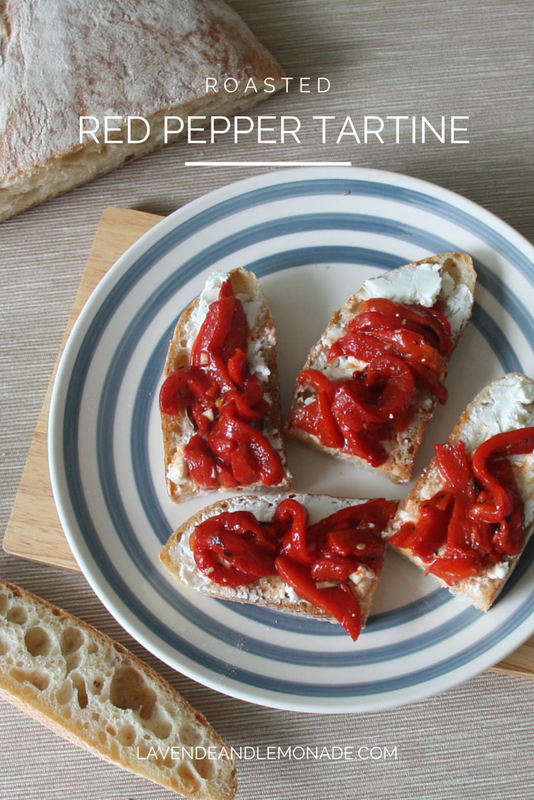 1) Slice the roasted peppers into thin strips that are about 1/4 inch wide. Place the strips into a small bowl and add the olive oil, vinegar, garlic, salt & pepper. Gently mix everything together. 2) Slice the bread into 3/4 inch slices. If the bread isn't soft and fresh, a quick toasting will help bring it back to life for the tartines. 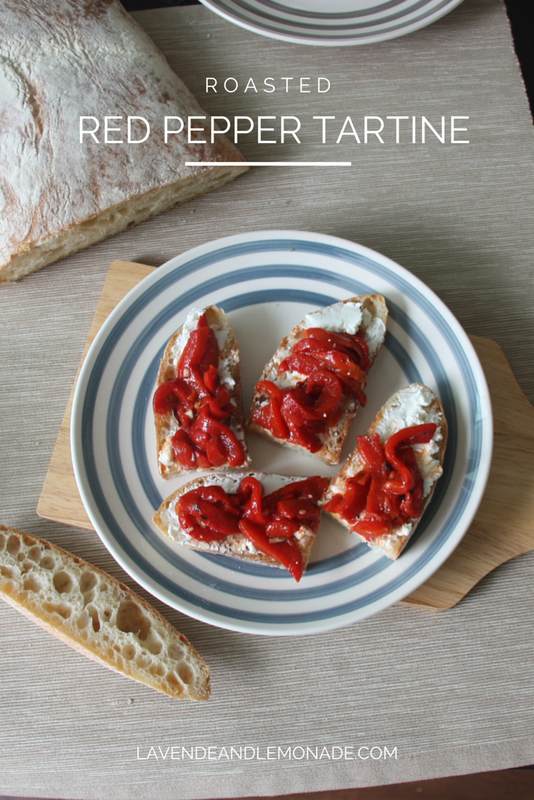 3) Spread the goat cheese onto the bread slices, and top with the red pepper mixture. The whole process takes less than 5 minutes, but packs such a pop of flavor that it tastes like it took hours. These are a great lazy-day snack, but also make a perfect appetizer. The bright colors make them a fun dish for holiday entertaining as well. Oh myyy. Yummy. 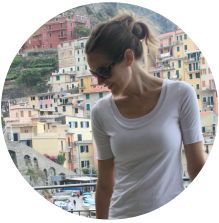 We too traveled Tuscany in 2013 and had something very similar to this, or so we thought. Made this. We're transported Back to Caffè Poliziano. Thank you for sharing!!! !